Schedule: (All times EDT) Game 1, Tuesday, at Boston, 8:09 p.m.; Game 2, Wednesday, at Boston, 8:09 p.m.; Game 3, Friday, at Los Angeles, 8:09 p.m.; Game 4, Saturday, at Los Angeles, 8:09 p.m.; x-Game 5, Sunday, Oct. 28, at Los Angeles, 8:15 p.m.; x-Game 6, Tuesday, Oct. 30, at Boston, 8:09 p.m.; x-Game 7, Wednesday, Oct. 31, at Boston, 8:09 p.m. (All games on FOX). Dodgers: 1B-DH David Freese (.282, 9 HRs, 42 RBIs with Pirates; .385, 2, 9 with Dodgers) or 1B-2B-DH Max Muncy (.263, 35, 79, .973 OPS), 3B Justin Turner (.312, 14, 52), SS Manny Machado (.315, 24, 65, .963 OPS with Orioles; .273, 13, 42, .825 OPS with Dodgers), CF-1B Cody Bellinger (.260, 25, 76, 151 Ks in 162 games), LF Chris Taylor (.254, 17, 63, team-high 178 Ks in 155 games) or Joc Pederson (.248, 25, 56) or Matt Kemp (.290, 21, 85, 115 Ks in 146 games), RF Yasiel Puig (.267, 23, 63), C Austin Barnes (.205, 4, 14 in 200 ABs) or Yasmani Grandal (.241, 24, 68), 2B Enrique Hernandez (.256, 21, 52) or Brian Dozier (.227, 16, 52 with Twins; .182, 5, 20 with Dodgers). Two of baseball’s most storied franchises. Only previous postseason meeting came in 1916 World Series when 21-year-old Babe Ruth pitched all 14 innings — in 2 hours, 32 minutes — as Boston beat Brooklyn 2-1 in Game 2. Even though Fenway Park opened four years earlier, game was played at Braves Field, home of city’s NL franchise, because it held more fans. Red Sox won Series in five games over Brooklyn Robins, as they were often called back then because of popular manager Wilbert “Uncle Robbie” Robinson. … Dodgers proudly broke baseball’s color barrier when Jackie Robinson played in 1947. Red Sox were last team in majors to have a black player, in 1959 with Pumpsie Green. … Boston had baseball’s highest opening-day payroll this season at $224 million. Los Angeles ranked fifth ($179 million). … Red Sox are 8-7 vs. Dodgers since interleague play began in 1997. Boston hasn’t hosted LA since 2010, and teams haven’t squared off since Dodgers won two of three at home in August 2016. Jansen earned two saves, and Price took a loss. … Dodgers have beaten Red Sox in Boston one time, on June 12, 2004. Alex Cora, now Red Sox rookie manager, drove in a run and scored another for LA in 14-5 rout. Among his teammates that day was Dave Roberts, who leads Los Angeles into second consecutive World Series. … Kershaw has never pitched at Fenway Park, and several other Dodgers stars will be making their first appearance in majors’ oldest ballpark. Dodger Stadium at 56 is third-oldest. … Boston opened as slight Series favorite. … Both teams have plenty of depth and will platoon at several positions to gain favorable matchups. … Dodgers have several quality options for DH in American League park, including Freese and Kemp against left-handers at top of Boston rotation. … Ryu had 1.15 ERA at Dodger Stadium during regular season and pitched seven shutout innings at home vs. Braves in Game 1 of NLDS. Both his NLCS starts, however, came in Milwaukee. He pitched fine in Game 2 but got hit hard in Game 6. … Manny Ramirez, Pedro Martinez, Bill Buckner, Nomar Garciaparra, Adrian Beltre and Rickey Henderson are among big names who spent time with both teams. So has Hill, a Boston-area native who was pitching in independent league before resurrecting career with Red Sox in 2015. … Teams made blockbuster trade in August 2012 that sent Adrian Gonzalez, Josh Beckett and Carl Crawford from Boston to Los Angeles in huge salary dump. Dodgers: NL West champions return to World Series after losing Game 7 at home against Houston last year. Dodgers (92-71) looking for first championship in 30 years — since Kirk Gibson, Orel Hershiser and Tommy Lasorda brought home 1988 crown. … Franchise making 20th trip to World Series, ties rival Giants for most among National League teams. Dodgers are 6-13 in previous Series appearances, with first one coming in 1916 vs. Red Sox. Last time Dodgers reached back-to-back World Series, they lost to Yankees in 1977 and ‘78. … Dodgers lost All-Star shortstop Corey Seager to early elbow injury and were 16-26 on May 16. Went from second-most wins in team history (104) last season to 92 this year, and from dominating NL West to needing Game 163 tiebreaker victory over Colorado at home to clinch their record sixth consecutive division title. … Dodgers outscored NL East champion Atlanta 9-0 in two Division Series home games and took best-of-five set 3-1. They won pennant with 5-1 victory at Milwaukee in Game 7 of NL Championship Series. Got homers from Bellinger, the NLCS MVP, and Puig to back solid start by rookie Buehler and strong relief work from Madson and Jansen. Kershaw closed it out with perfect ninth on 15 pitches. Three-time Cy Young Award winner also bounced back from Game 1 flop with Game 5 gem. … Buehler emerged as Dodgers’ second-best pitcher behind Kershaw after starting season at Triple-A Oklahoma City. Limited hitters to .193 batting average while striking out 151 against 37 walks in 24 regular-season games, including 23 starts. Buehler had second-lowest WHIP (0.92) and opponents’ on-base percentage (.249) among rookie pitchers with 20 or more regular-season starts since 1913. … Dodgers dig the long ball. They hit eight homers in NLDS and five more in NLCS after setting franchise record with NL-leading 235 during regular season. Red Sox: Looking for fourth World Series title since 2004 after ending 86-year drought. Making first Series appearance since defeating Cardinals in 2013. Red Sox are 8-4 in previous Series appearances. … Cora trying to become fifth manager to win championship in first season, first since Bob Brenly with Arizona in 2001. … In winning third straight AL East crown and setting franchise record for wins, Red Sox (108-54) improved by 15 victories over 2017 record. … Eliminated rival Yankees 3-1 in Division Series after finishing eight games ahead of New York, their largest AL East victory margin. Holt became first player to hit for postseason cycle during 16-1 rout in Game 3 at Yankee Stadium but was out of starting lineup for every other game in series. … Beat defending World Series champion Astros 4-1 in ALCS, avenging playoff loss to Houston in 2017 Division Series. Red Sox dropped opener before winning four straight — including three in a row at Minute Maid Park to improve to 5-0 on road this postseason. … Benintendi saved wild Game 4 victory with diving catch in left field. Bradley had only three hits in series, but two key homers and nine RBIs earned him ALCS MVP prize. … Devers batted .350 with seven RBIs in AL playoffs. Betts, the likely AL MVP, batted just .205 with three RBIs but scored eight runs and shined on defense. … Red Sox spent 141 of season’s 186 days alone in first place and another seven in a tie for first, taking sole possession of division lead for good on July 2. … Twelve teams in baseball history have won at least 108 games. Seattle won 116 in 2001 but lost ALCS to Yankees. The previous four won World Series. … Red Sox were only team in majors to go all season without losing four straight. Team also accomplished that in 1903 and 2013, winning World Series both times. … It’s the fifth time Red Sox have had best record in baseball by themselves (1903, 1912, 1915, 1946). … Cora had second-most wins for a first-year manager. Ralph Houk’s 1961 Yankees won 109 games. … Boston’s 57-24 record at home was best in baseball. … Boston led majors with 876 runs, 355 doubles and 594 extra-base hits. — Redemption Song. 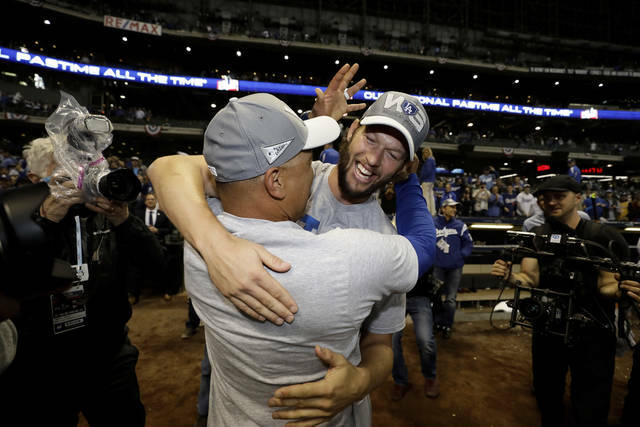 Kershaw has been trying for years to add a World Series championship to all his individual accolades. But the 2014 NL MVP has been a mixed bag in postseason play (9-8, 4.09 ERA), and he faltered in a critical game during last year’s Series. Two of his three starts this October have been excellent, the other was a dud. The 30-year-old lefty can opt out of the final two years and $70 million remaining on his contract this offseason and become a free agent. He said during the NLCS he hadn’t made a decision on his future. — Sale Price. All eyes will be fixed sharply on Boston’s top two left-handed starters. Sale said he’s ready to pitch the opener after being hospitalized with a stomach illness and missing an ALCS turn because he was still feeling weak. Shoulder trouble sidelined him during the second half of the season, too. Price, who has had a rough time in Boston since signing a $217 million contract before the 2016 season, was 0-9 with a 6.16 ERA in 11 career postseason starts before striking out nine over six shutout innings of three-hit ball on three days’ rest to win the ALCS clincher in Houston. Is he finally over that October hump? Can the Red Sox count on Sale to be at full strength? — The Villain. Machado drew the ire of Milwaukee players and fans for his NLCS antics, not to mention a fine. Brewers slugger Christian Yelich even called the star shortstop a “dirty player.” Boston fans are plenty familiar with Machado after his late slide last year injured longtime Red Sox second baseman Dustin Pedroia, and led to a tense situation at Fenway with Sale throwing behind Machado. A pending free agent with big dollars likely on the horizon, Machado was acquired by Los Angeles in a July trade with Baltimore. He had three homers, two doubles and nine RBIs during the NL playoffs, including a surprise bunt single that paid dividends in Game 7 at Milwaukee. — The Hero. Even as the opposing manager, Roberts is sure to receive a warm ovation at Fenway Park. 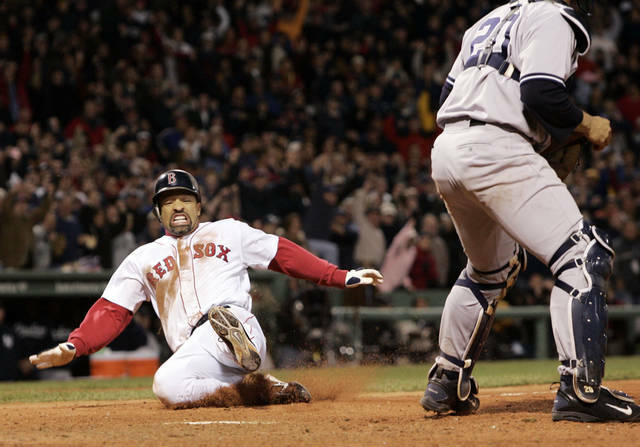 He’s still a fan favorite in Boston for his daring stolen base that sparked an unprecedented comeback from a 3-0 deficit against Mariano Rivera and the rival Yankees in the 2004 ALCS. This is the first time both Series managers have played for each team. — Moving Mookie. Cora said it’s possible Betts, a Gold Glove right fielder, could play second base in the National League park, where there’s no DH, to make room for J.D. Martinez in the outfield. Betts was a second baseman in the minors and still takes pregame grounders during the regular season. He’s played second in the majors, including six innings this year. J.D. Martinez’s 43 homers were the most for a player in his first year with the Red Sox. He batted .313 with two homers and nine RBIs during the playoffs, and Cora said the slugger will definitely play in Los Angeles. Boston could also just shift Betts to a different outfield spot and bench Bradley or Benintendi — especially against left-handers. BOSTON (AP) — In the souvenir store across from Fenway Park, it will set you back $100 for a framed, autographed photo of “The Steal,” Dave Roberts’ stolen base in the 2004 AL Championship Series that kick-started the Red Sox comeback against the New York Yankees and ended Boston’s 86-year title drought. Other mementos from that drought-busting championship may fade, but the intervening years have done little to dim Roberts’ legacy in Boston since he helped the Red Sox rally from a three-games-to-none deficit against the rival Yankees en route to their first World Series crown since 1918. Havlicek stole the ball, Orr sailed through the air, and Vinatieri split the uprights (twice) to cement themselves in Boston sports history. But few athletes have squeezed their way into the city’s lore like Roberts. A trade deadline acquisition who was obtained for his speed, he hadn’t played in 10 days when he entered Game 4 of the ‘04 ALCS as a pinch runner in the ninth inning at Fenway. The Red Sox trailed 4-3 in the game, and 0-3 in the best-of-seven series. Roberts stole second, then slid home to score tying run that began Boston’s unprecedented comeback. He pinch-ran again, and scored again, in Game 5, but he never appeared in another game for the Red Sox, standing by as they swept the St. Louis Cardinals to set off a celebration that generations of New Englanders had been waiting for. Cora was in his last year as a full-time player with the Dodgers in ‘04, and three years and two teams later he was a utility infielder in Boston when the Red Sox went back to the Series. He entered Game 1 as a defensive replacement and had his only plate appearance in Game 3, when he laid down a ninth-inning sacrifice bunt that led to an insurance run. 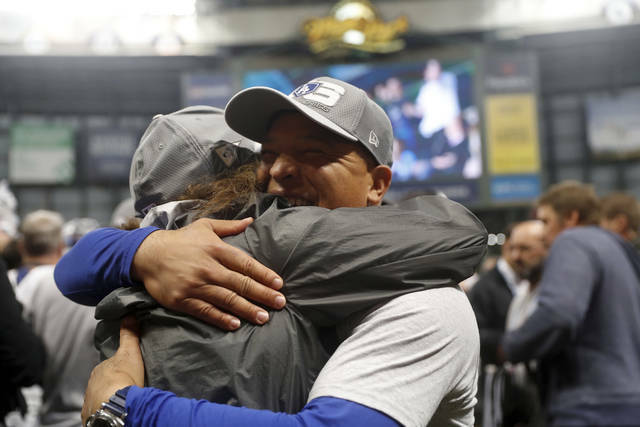 “I didn’t take one swing in the World Series, and I feel like I accomplished (something), I was part of the equation,” said Cora, who also won ring as a bench coach for the Houston Astros last season.